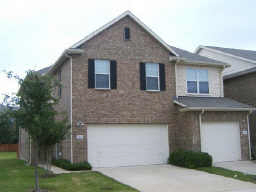 We SOLD this Lewisville Home FAST! 3 Beds 2 Baths 1 Partial Bath 1,860 Sq. ft. IDEAL LAYOUT FOR THIS COZY 3 BEDROOM, 2.5 BATHROOM TOWNHOME! GREAT LOCATION WITH NEARBY SHOPPING CENTERS, DINING, AND EASY ACCESS TO 121 AND HWY 35. OPEN KITCHEN INCLUDES CERAMIC TILE FLOORS AND BACKSPLASH, SLEEK BLACK APPLIANCES, AND A BREAKFAST BAR. OTHER FEATURES: GAMEROOM, HUGE BEDROOMS, GREEN BELT, SOARING CEILINGS, FENCED YARD, AND MUCH MORE.